Diego Mingolla graduated from Hugo Wolf Superior School for Accompanists in Acquasparta, Conservatorio ‘G. Verdi’ and University ‘DAMS’ in Torino, later honing his skills in masterclasses with Helmut Deutsch and Antonio Ballista. Since 1989 he has received various prizes in international competitions, both as a soloist and as a chamber music player. Diego has performed all over in the world, including in Stresa, Torino, Naples, Rome, Milan, Venice, Salzburg, Luxembourg, Bilbao, Seoul, Buenos Aires, Cordoba, Montevideo, Santiago in Chile, Mexico City, London, Paris, Geneva, and Almaty. Specializing in performance practice of chamber music and opera, Diego has forged important artistic collaborations with artists such as Mirella Freni, Jennifer Larmore, Fiorenza Cossotto, Barbara Frittoli, Alessandro Corbelli, Lucio Gallo, and Rockwell Blake. 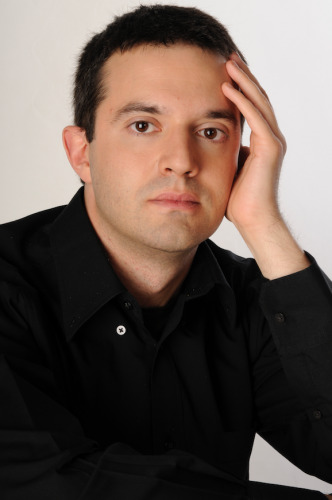 He has acted as the collaborative pianist for the International Sommerakademie Mozarteum in Salzburg, and the L. Perosi Academy for Post Graduate Music Studies in Biella, for masterclasses with Marco Rizzi, Robert Cohen, Roberto Ranfaldi, Pavel Berman, Anna Serova, Davide Formisano, and Enrico Maria Baroni. Very active in the theater world, he has been esteemed as an onstage pianist, composer, arranger, and musical consultant, working with such theater makers as Davide Livermore, Arturo Brachetti, Willy Landin, and John Turturro, and with the Children's Theater Foundation in Torino. He has also worked with Ugo Nespolo as musical consultant and performer. Diego composed and performed the soundscape for Turin's Metro and participated in the construction of MUSLI, the School and Children's Book Museum in Turin. He won the Audience Prize at the sixth European contest organized by the ‘Strade del Cinema’ Festival dedicated to silent movies with live accompaniment. Diego participated in the Symphony Orchestra of India's 12th season, organized by the National Centre for the Performing Arts, Mumbai, in the role of chorus master and repetiteur. He has also appeared as a guest soloist, coach, and conductor with the State Philharmonic of Kazakistan and their chorus, Chapella, in the 2012-13 season. Also for this ensemble, he composed Psalm 150, performed in their inaugural season. Since 2014 Diego has been working with Jean-Christophe Keck and OCHA (Orchestre de chambre de les Haute-Alpes). He has been guest artist at ’Violoncelles en folies’ festival and guest teacher at Nei Stëmmen Academy of Luxembourg.